Yesterday in the speech I made on the second round of policies forming my Growth Strategy, I stated that we will double the income of agricultural enterprises and farming communities over ten years. Losing no time, today I have come to a tea plantation in Oita Prefecture on the island of Kyushu. A construction firm newly launched agricultural operations, turning abandoned farmland into a beautiful tea plantation. Through a tie-up with a major beverage manufacturer, this company is now engaged in sixth-sector industry, extending its operations to processing, commercializing its products, and other areas. I felt very strongly that people with drive are opening up new worlds within agriculture. We will support agricultural enterprises that are working hard, aiming to make agriculture attractive to young people. * Predatory Pricing: Basically, the higher Wal-Mart’s market share, the higher its prices. Wal-Mart will go into a town, charge below cost until their competition is gone, and then raise prices. Examples include Conway, AK where Wal-Mart’s attempted to undercut drug stores and Fresh Farms in Va. where the prices of goods near the competing supermarket were markedly lower than at another Wal-Mart 20 miles away without much competition. * Sales Tax Revenue – Especially in New York City, Wal-Mart proponents often mention that people already shop at Wal-Mart in New Jersey so why not keep the tax dollars and shoppers in New York State? Though convincing on the surface, this claim is flawed. People shop in New Jersey because they pay a significantly lower sales tax, can fill up their car with less costly gasoline and buy their soda without a deposit. Even with a Wal-Mart, consumers will continue to flock to surrounding areas as long as New York City maintains its high taxes and prohibitive business environment. If pundits and politicians are concerned about the “leakage” of business, they should make it easier for all merchants to do business in New York , not encourage the building of megastores that threaten neighborhoods and put a strain on public resources. * Cannibalization: Studies show that Wal-Mart, unlike claims to the contrary, draws most of its business from local stores, not from new shoppers (84%). * Job Growth: Wal-Mart’s entry results in the replacement of entrepreneurs and local wholesalers with low paid clerks and out-of-town suppliers. Where you once might have had a town with ten florists, each with numerous employees, you know have 1 Wal-Mart flower manager with a couple of low wage employees. Moreover, because the company outsources so much of its production oversees, the United States continues to lose its manufacturing base and those put out-of-work either remain unemployed or have to take lower paying jobs. * Quality of Life: Crime and Traffic– A major concern of residents all across the country is their quality of life. Though box stores like Wal-Mart promise the benefits of low prices and one-stop shopping there are tremendous costs to the community. Due to its immense size and inventory, Wal-Mart is often a magnet for crime and because it relentlessly pursues even minor offenses community police resources are taxed. The 200,000 sq. ft. stores also bring with it incredible traffic as well as all the related problems of air pollution, asthma and the increased response time for emergency services. * Connection to the Community – Unlike Wal-Mart and other large box stores, small businesses are strongly rooted in the community and do not have the luxury of shutting down even if profits start to shrink. Wal-Mart however, is only considering an overall bottom line and won’t think twice about closing stores, no matter the local effect. It has also been known to open up a discount store, drive out all competition and then close that same store to open up a supercenter somewhere else. 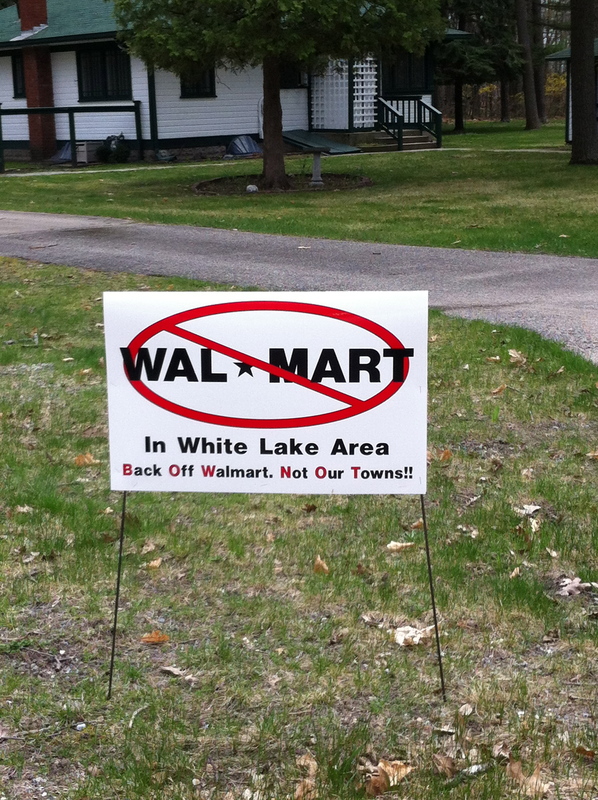 Therefore, the community is deprived of both local business and its Wal-Mart. * Government Subsidies: Wal-Mart, the largest retailer in the world, is the beneficiary of billions of dollars in incentives and tax breaks not available to smaller competitors. According to Good Jobs First, Wal-Mart receives over 1 billion dollars a year in subsidies and that only takes into account 244 stores and distribution centers for which data was available. Contrary to what Wal-Mart proponents say, neighborhood retailers are not afraid of competition. They are, however, worried when the government creates an unlevel playing field in favor of retail behemoths. * Health Care: More than two thirds of Wal-Mart workers do not participate in the company’s health plan, due to high premiums and deductibles. In order to obtain care, many of these low wage earners turn to government-funded (i.e. taxpayer-funded) program, costing each and everyone one of us in the end. Nearly 700,000 Wal-Mart employees rely on government programs and Wal-Mart workers and their families are the number one users of public healthcare in states such as Florida, Georgia, Iowa and Arkansas. * Competition: Though Wal-Mart is often held up as the standard-bearer for competition, its actions reveal a company that sees competitors as nasty inconveniences. If Wal-Mart was truly competitive it wouldn’t demand enormous subsidies for a good number of its stores, subsidies that either aren’t available for or aren’t advertised to small business. If Wal-Mart was truly competitive it wouldn’t price items below cost, force out competitors and then raise its prices again. If Wal-Mart was truly competitive if wouldn’t pass along health care costs to taxpayers. In a more general sense, because Wal-Mart has eliminated businesses large and small, it is creating a more homogenous marketplace, one bereft of diverse, competitive merchants. * The Race to the Bottom: Devastating Impact on Supermarkets and other Businesses: During the past decade, over 13,000 supermarkets have closed, which led to the replacement of unionized workers earning family-sustaining wages with low-paid and under-benefited workers. In Mississippi, a study found that in small towns in the state, five years after the opening of a Wal-Mart, the dollar volume of grocery store trade had collapsed 17%. For the supermarkets and other businesses that remain open after a Wal-Mart has been built the affects can be just a detrimental. As has been seen in California, St. Louis, Missouri, and Eugene, Oregon, Wal-Mart creates a “race to the bottom” by forcing competing stores to either lower their workers’ wages and benefits or face extinction. * The Need for Economic Impact Studies – All of the abovementioned issues reinforce the need to conduct thorough and economic impact studies when large box stores want to build. Wal-Mart claims that jobs are created but what is the nature of those jobs, how many jobs will be lost and how will existing jobs be affected? Wal-Mart claims that the town or municipality will gain much needed tax revenue but does this potential benefit outweigh the subsidies, drain on public resources and traffic that results? The only way to find the answer to these and other questions is a complete cost-benefit analysis.